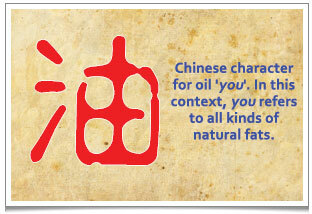 The Chinese Character for oil, referring to all kinds of natural fats. 看似平凡的生活，蕴含着深刻的医理： ‘柴米油盐酱醋茶’ 之油”. This is the third of seven blog posts based on the Chinese tradition of ‘Open Door Seven Items’, or what might be called ‘the Householder’s Essentials’. My first two posts were about fire, wood and warmth and rice, grains and pulses. We move on now to the next level in the hierarchy of human needs, oil. That is, oils and fats used in cooking. In the ancient Chinese script, the character for oil is made up of the character ‘you’ (由) and the radical for (氵). The ‘you’ character is drawn like a little vessel with a drop of fluid just about to go into it. Oils and fats are necessary for the healthy functioning of our body. Many people nowadays feel a disdain for fats, especially if animal-derived. A more balanced view taking hold now is that there are ‘good’ fats as well as ‘bad’. Western medicine discourages the consumption of lard, though TCM (Traditional Chinese Medicine) suggests that, in moderation, animal fats are good for us, and might actually reduce the growing problems of high cholesterol, blood pressure and blood sugar (what Chinese call the ‘three highs’), gout and hyperuricacidemia. Try this experiment. After frying some vegetables in lard, wash your wok. Hot water will be enough. Removing what’s left of the lard will be very easy. Then fry some more vegetables, this time using a refined vegetable oil. To wash the wok this time, you’ll definitely need some detergent. Hot water won’t be enough. I used to wonder why my grandma never used washing-up liquid, but always cleaned her wok with hot water and a brush made from coconut leaves’ stems. I assumed it was because she had cooked over extremely hot charcoal so that nothing ever stuck to the wok. Now I see it as proving the relative purity and quality of lard, and I infer that a little bit of lard is relatively easy for the body to cope with. I remember my grandma frequently used caul fat in her cooking as she thought it was the most delicate fat in terms of flavour. Caul fat is a thin, net-like membrane taken from the abdominal cavity of a pig or sheep, pig being the preferred product. The membrane is used to wrap pates or forcemeats, among other uses. My grandma would slowly render the oil from the caul fat and keep it in a bowl in her larder. Any crispy bits were set aside for sprinklings. I recall being aware of its wonderful smell whenever I wandered into her kitchen. The ancient Chinese used soap made from the pig’s pancreas. They knew that the pancreas produces insulin to control the sugar in our blood and secretes enzymes into our intestines to help to break down starch and fats. Hence this was seen as a good ‘ingredient’ for cleaning. Shaoxing rice wine, shredded fresh ginger and coriander leaves to serve. briefly ‘rinse’ the lamb pieces in boiling water for 30sec. Strain and discard water. Put all the ingredients into a double-boiler or into a pot in a bain marie. Double-boil or cook in low oven gently for 1 ½ to 2 hours for a clear consommé. 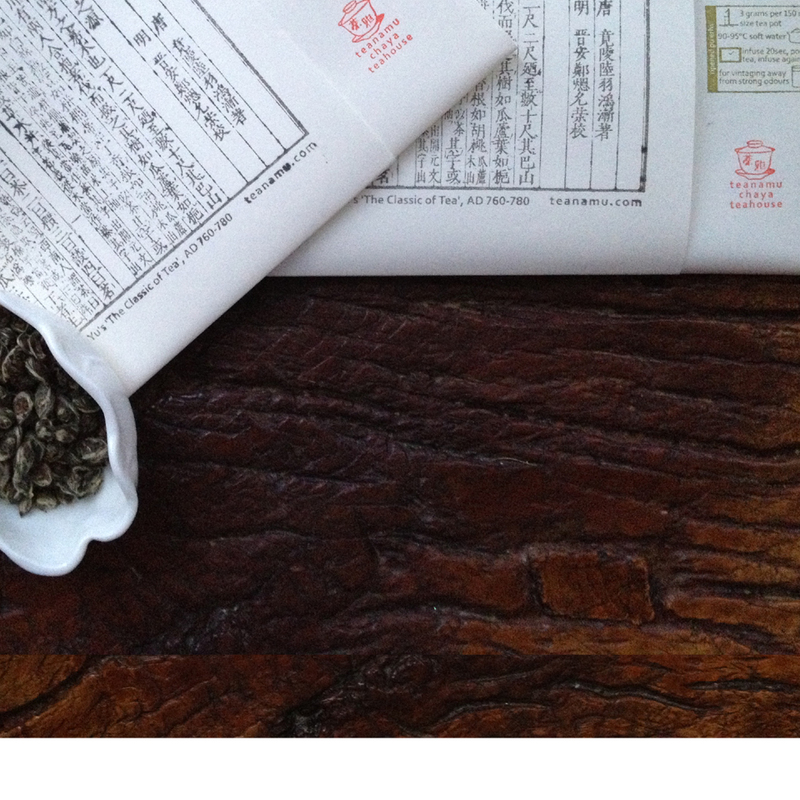 Serve hot with a few drops of Shaoxing rice wine, shredded fresh ginger and coriander leaves. PS: dark oolongs like Wuyi Shuixian or ripened Pu Erhs like Emperor Pu Erh are great with this nourishing brew. An observation by a TCM practitioner set me thinking. He observed that refined vegetable/seed oil has a very long shelf life compared to pork lard which lasts a week maximum. Many food items now have a shelf life way longer than what we used to expect. I suspect, that cannot be natural or good for our health! TCM also believes that, when we consume cold fizzy drinks, we are bring a lot of air bubbles and Yin into our body. The body has then to work extra hard to warm our core and expel those gases, draining and tiring us but also encouraging fats to solidify in our body to keep our organs warm. We should always look to find the source of a problem. If one is obese, the solution is not always to reduce fat accumulation but to see what makes this person’s body accumulate fat in the first place. Many overweight people tend to be lacking in inner core energy because the process of converting nutrients into energy doesn’t flow well but is blocked. Many people spend hours in the gym to ‘achieve perfection’. From a TCM perspective, training muscles to be hard and tense all the time is untenable, creating unnecessary blockages in the body. These people tend to be ‘too weak to stand a gust of wind’ (‘ruo bu jing feng’ 弱不禁风). They fall sick easily. They are extremely good at eliminating body fats but then their body has no protection against external elements. The moment they stop exercising, their body automatically starts storing fats again to restore nature’s balance. On the subject of excess, it seems like nowadays, especially in Chinese culture, the only way to express joy or join in a festivity is overconsumption. I’m reminded of the ancient Romans, who actually invented emetic drugs to enable them to throw up after a meal so that they could proceed straight on to the next one! What TCM practitioners are trying to tell us that one should try to consume in moderation, respecting where we live. If you live near the sea, eat the local fish! If you have an orchard, eat the fruit that grows there! Then also bear in mind the season and your own inherited body constitution. Aim for a rough Yin Yang balance too. Here, there are certain general principles. Duck are water poultry and therefore Yin. Non-water animals, like chicken, are Yang. If you are irritable, with a Yang body type, then you should avoid the over-stimulation of eating chicken, or only eat chicken that has been gently poached with Yin ingredients like tofu and mushrooms. Pork is considered good for the kidneys, especially the pig’s organs like the brains, and the bone marrow (‘gu sui‘ 骨髓) as they are very Yin in nature. Lamb being Yang is good for our liver. When poached with some oolong or ripened pu erh tea leaves, Chinese angelica root (‘dang gui’ 当归) and fresh ginger it’s very good for keeping winter colds away, and so it’s popular in northern China. It is medicine disguised as food! Seafood such as crabs are Yin and may be cooked in wine, though I advise (for some people anyway) against consuming them with beer or green tea which are themselves Yin in nature. Oils that are simply extracted by a process of crushing are best. For example, sesame oil, if extracted by crushing, doesn’t have a high boiling point as it is slightly ‘impure’, but it is the impurity that makes it aromatic and good for the body. Chemically extracting oils may be very efficient but does not make for the healthiest of product. I think many of us have lost the ability to listen to our body. We interfere with it and interrupt it instead, in an effort to control it and the world around it. It takes effort, I know, but the more we can work with nature and not against it, the better for us. As we say, ‘hui jia chi fan‘ (回家吃饭): have a meal at home! To which I’d add: eat local, eat seasonal, and cook with love! I can personally attest to the fact that I’m feeling much better since I started to use lard and tallow in my stir-fry’s. all the thing you wrote are in line with a paleo (or primal) diet which emphasizes natural fats, meat and vegetables and completely eliminates foods that need processing, among these all the factory manufactured vegetable oils and sugar. Organs and bone marrow are also touted as high nutrition food and it was known that in the middle ages european feudal lords would collect all the offal for themselves and the peasant would get the muscle meat since it wasn’t as nutritious.